SO. For those (pantsers) who struggle with character development, think of your characters in these very basic terms. 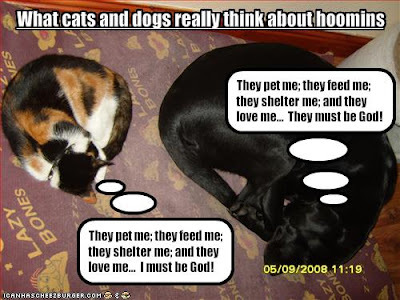 Do they fall toward the CAT (selfish, narcissistic) or DOG (servitude, naive) side? In other words, ask yourself what their motivations are, how they would handle the conflict in your book, and go from there. It's only a jumping point! 8:00 a.m. - Oh, boy! Dog food! My favorite! 9:30 a.m. - Wow! A car ride! This is a blast! 9:40 a.m. - A walk in the park! Ate some crap... Delicious! 10:30 a.m. - Getting rubbed and petted! I'm in love! 12:00 p.m. - Lunch! Yummy! 1:00 p.m. - Playing in the yard! I just love it! 3:00 p.m. - Staring adoringly at my masters...they're the best! 4:00 p.m. - Hooray! The kids are home! I'm bouncing off the walls! 7:00 p.m. - Get to play ball! This is too good to be true! 8:00 p.m. - Wow! Watching TV with my master! Heavenly! 11:00 p.m. - Sleeping at the bottom of my master's bed! Life is sooo great! Day 683 of My Captivity: My captors continue to taunt me with bizarre little dangling objects. They dine lavishly on fresh meat, while the other inmates and I are fed hash or some sort of dry nuggets. Although I make my contempt for the rations perfectly clear, I nevertheless must eat something in order to keep up my strength. The only thing that keeps me going is my dream of escape. In an attempt to disgust them, I once again vomited on the floor. Today I decapitated a mouse and dropped its headless body at their feet. I had hoped this would strike fear into their hearts, since it clearly demonstrates what I am capable of. However, they merely made condescending comments about what a ''good little hunter'' I am. The audacity! I am convinced that the other prisoners here are flunkies and snitches. The dog receives special privileges. He is regularly released--and he seems more than willing to return! He is obviously retarded. The bird has got to be an informant-- I observe him communicating with the guards regularly. I am certain that he reports my every move. The captors have arranged protective custody for him in an elevated cell, so he is safe-- for now. But I can wait. It is only a matter of time! I love this. My ms is from two POV's and one is definitely cat, while the other is a dog! I miss the days of being a cat owner... damn my super-fastidious husband! ROFL. No wonder I love cats (too bad my husband doesn't like them, but he's not into dogs, either). You're a panster. I seriously never would have guessed it. Stina, I don’t think I’m a true pantser. I fall in the middle. I definitely plot out my chapters, but I don’t get too in depth! And can I say I'm glad you don't notice since you are one of my critiquers? Phew! Heeehee! Too funny. I visited my sister last night and we were laughing about her dog. For one he has a little bit of OCD, (he walks backward out of the kitchen every time and always has to check one bedroom before entering the other)and he takes on the stoner on the couch role. Like after something's been there for weeks he'll finally notice it. You make a great point! I never thought of characters being dog vs. cat people. Now I get it :) The cat diary is hilarious! I love the cat diary! hahahaha. I am shoot from the hip kind of gal. Love the pet diaries. My dad always told me there were two types of people. Cat people and Dog people. If I ever got upset with someone growing up he would just say "What kind of person are they?" I would pick cat or dog and figure out how to solve my problems from there. HA! I love the comparison. I'd like to think my MCs are a little of both. They're teens so they have to be a little self-centered. But I also like to make them giving and thoughtful. As for me, I'm a mix too. But as a pet, I love cats best. Character development really intrigues me. I am especially drawn to characters that switch sides...like the dog that becomes the cat...or vice versa.